Woodland phlox, blue phlox or wild sweet William (Phlox divaricata ssp. laphamii) of the Phlox (Polemoniaceae) family is the first phlox to bloom in the spring in Arkansas. The genus name is Greek for “flame,” in reference to many species of the genus with strongly colored corollas. The specific epithet, from the Latin, refers to the clonal “spreading” of the plant or possibly to the spreading branches of the inflorescence. The subspecies name honors Wisconsin scientist Increase A. Lapham. The species occurs from Texas to South Dakota, thence east and south to the Atlantic and Gulf Coasts. In Arkansas, it occurs statewide. Woodland phlox grows in rich, well-drained, mesic, sandy to rocky soils in deciduous woodlands, with full or partial shade. Plants also grow in more sunny sites that have dependable moisture, such as stream banks. With prevailing dry conditions, plants may lose leaves and go dormant. Stems and pedicels are covered with a dense short, soft, white pubescence, which lessens with time. New stems and pedicels tend to be purplish, becoming green with age. They emerge from shallow, uniformly-sized, slender white roots. There are two stem types. One stem type produces the inflorescence, referred to herein as a “floral stem.” Floral stems grow to about 14 inches and bear short branches within the inflorescence. They emerge in early winter and die off after fruit matures. A second stem type, referred to herein as a “clonal stem,” is initially erect, but becomes reclined with new apical growth. As the stems elongate, the older, lower leaves drop off. The leafless portion, surviving over a number of years, may be from an inch to several feet long. As this leafless portion becomes covered with duff, long, slender, white roots and stems emerge from the leafless leaf nodes. Over time, intertwined clonal stems may form mats of evergreen leafy stem apexes. Photo 1: Floral stems appear in early winter with flowers reaching anthesis in March. Several broad-leafed clonal stems can be seen on the left side of photo. Leaves of both stem types are similar in that they 1) are in opposite, widely spaced pairs set at 90 degrees to each other (decussate pairs), 2) have a medium green adaxial surface and a lighter green abaxial surface, 3) are sessile to clasping with bases that meet around the stems, 4) have scattered pubescence above and denser shorter pubescence below, and 5) have entire margins. Also for both stem types, pinnate leaf venation consists of a straight, skinny, sharply recessed midrib above and a strongly expressed midrib below, with off-set secondary veins that fade into obscure tertiary veins. The base of the leaf blade ascends from the stem, while the remainder of the blade is flattened toward sunlight with a gentle up-folding along the midrib. Leaf shape of the two stem types is different. Floral stem leaves are ovate-lanceolate (to 2½ inches long and ½ inch wide) while clonal stem leaves are broadly oval to ovate (to 2 inches long and 1 inch wide). Photo 2: Floral stems have more-elongate leaves than clonal stems. Note pubescence of leaves and calyxes. Photo 3: In August, only clonal stems remain. Inset shows a clonal stem in December that has leafy current-year growth and 4 to 5 years of growth that has produced roots and stems at leaf nodes (leaves having dropped off). The inflorescence, which terminates a floral stem, first appears as a tight spiky cluster of medium green, closed, pointed calyxes and a few small subtending leaves. With growth, this single cluster expands into several loose clusters: a terminal cluster and a couple of upper, axillary clusters. These several small clusters form a rounded (2 to 3 inch wide) inflorescence with 20 or more flowers. Stems and pedicels, purplish, have a dense, short, white pubescence. As corollas approach anthesis, extending well out of the calyxes, they have long slender tubular throats that abruptly widen distally into a shorter, twisted spindle of tightly overlapped corolla lobes. At anthesis, corolla lobes spread to about one inch wide, with a “smooth” coloration of various shades of blue, lavender and blue-violet. A dark blue to purplish color at the throat entrance is enhanced by being outlined by a lighter shading. Interior and exterior of the throat are a similar dark color. Lobes, with a rounded to slightly peaked apex, are obovate (broader at apex and a wide taper to base) and slightly overlapped. Calyxes, covered with spiky, sticky pubescence, have short cupped bases that are rimmed by five very long, lanceolate lobes. All flowers of a plant bloom at about the same time with bloom period extending over two weeks. Photo 4: Tightly wrapped corolla lobes unfurl to expose a dark throat. Note the beautiful pinwheel-like overlapping arrangement of the lobes when still in bud, as well as the long teeth of the calyxes and long pubescence of calyxes compared to that of stems and pedicels. Photo – mid March. Photo 5: This young plant has many floral stems and several clonal stems (to the left and below). Flowers have five stamens and a pistil, hidden within the corolla tube. Stamens are fused to the tube (rather than to the tip of the pedicel, i.e., the receptacle) and of varying lengths. They have white filaments supporting elongate anthers that produce bright yellow pollen. The style, set on a smooth green ovary, is pale green with a three-part spreading stigma. Ovary, style and stigma are short and about equal length. With fertilization, the ovary becomes a three-chambered, smooth, ovoid fruiting capsule that produces a few seeds. Capsule length is less than ⅛ inch. Photo 6: Flowers have five adnate stamens of unequal length that bear elongate anthers. With calyx partially and corolla tube fully removed, the pistil, comprising ovary, style and stigmas, is revealed. Woodland phlox is an ideal plant for shady natural areas, rock gardens and shade gardens that have fertile mesic soil. Its mass flowering in late winter is an early sign of winter’s imminent departure. Clonal colonies and newly seeded plants are not aggressive. With shallow clumping roots, sweet William can grow well with other native species. It may be eaten by deer and rabbits. 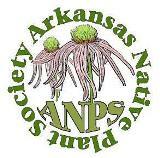 Other species of the genus that occur in Arkansas: 1) broad-leaf phlox (Phlox amplifolia), 2) sand phlox or cleft phlox (Phlox bifida – two subspecies), 3) annual phlox (Phlox drummondii), 4) smooth phlox (Phlox glaberrima), 5) garden phlox (Phlox paniculata), 6) downy phlox (Phlox pilosa – two subspecies), and 7) moss phlox (Phlox subulata). Characteristics of woodland phlox that help separate it from these other species are its 1) broad leaves and sterile clonal stems, 2) hidden stamens, 3) broad corolla lobes with rounded to slightly peaked apexes, and 4) lack of a tap root. Note: Phlox divaricata ssp. divaricata, another recognized subspecies (not known to occur in Arkansas), has very similar characteristics, except subspecies divaricata has apically notched corolla lobes. The range of subspecies divaricata partially overlaps that of subspecies laphamii, but subspecies divaricata primarily occurs farther east and north. Flower color of subspecies divaricata tends to be more pinkish. This entry was posted in Know Your Natives, Native Plants, Wildflowers and tagged Know Your Natives, Phlox, Phlox divaricata, Woodland Phlox. Bookmark the permalink.